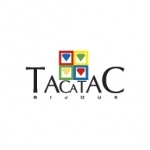 Passionate about stones and beauty, Anne de la Ville Baugé created TACATAC in 2004. With already several lines of jewels to her credit, her creations harmoniously combine high-end designs, traditional as well as costume jewellery. Elegant, sophisticated, easy to wear on any occasion, TACATAC creations both go easily with your other jewels and emphasise them. Choose your stone and pick your chain, TACATAC will customise a unique piece for you. Rings under £120 , from £20 to £200 for earrings, silver bracelet around £20 gold bracelet around £100 & short and long necklaces between £40 & £600 depending on your choice of stones and metal.